English-speaking immigrants from countries like Australia and India should be given priority to come to the UK over Eastern European migrants who “haven’t fully recovered from being behind the Iron Curtain,” Nigel Farage has said. The UK Independence Party (UKIP) leader admitted he prefers immigrants from these Commonwealth nations because they understand the British legal system and have a similar culture to Britain’s. “Let's suppose one from Mogadishu with the same skills, the same ability to speak English, but not as a first language to one from Melbourne – do you have a preference?” BBC presenter Evan Davis asked Farage on Wednesday evening. 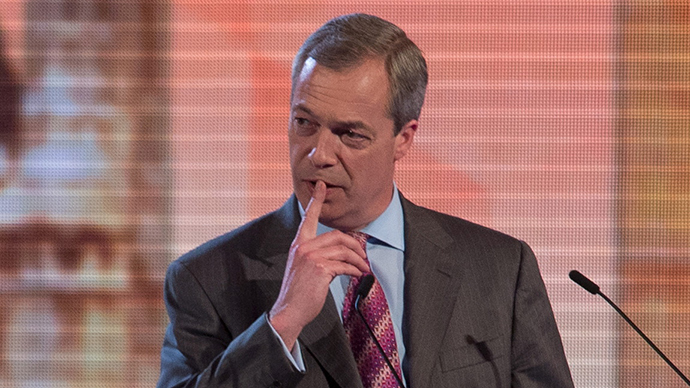 Farage has previously claimed he has a “non-discriminatory” policy on immigration, as UKIP would not give preference to EU migrants over those from the rest of the world. Last year, he told LBC radio, “I actually want us to have an immigration policy that is non-discriminatory, because at the moment we discriminate in favor of people from Poland, or Romania, or Bulgaria, regardless [of] who they are, and we discriminate against people from New Zealand … or from India, or Canada, or whatever else it may be. He also admitted that he and his party used controversial and provocative statements to get attention. Farage said such tactics were no longer necessary for UKIP.